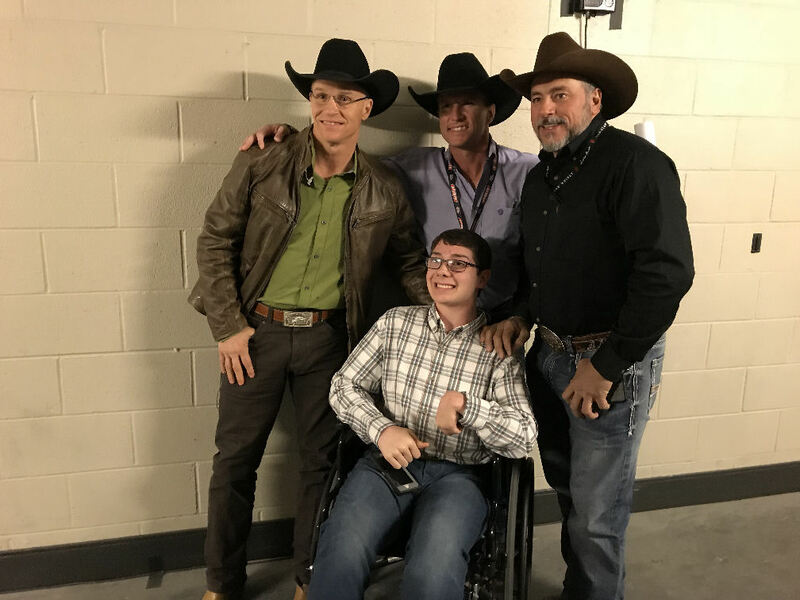 Ethan Brown’s childhood dream came true last week when he attended, VIP-style, the 2018 Professional Bull Riders (PBR) World Finals in Las Vegas courtesy of the Greater Kansas City Chapter of The Dream Factory and PBR. Ethan, a junior with triplegic cerebral palsy at Salina High School Central, attended five days of bull riding. His VIP experience included meeting bull riding legends and walking the black carpet with 2017 PBR World Champion Jess Lockwood and 2018 contender Chase Outlaw. But the highlight of his trip was the chance to step in as a guest commentator on the live broadcast of RidePass. Ethan is interested in a sports broadcasting career and is enrolled in Central High’s new broadcasting class. During the application process with The Dream Factory, Ethan shared that his dream was to call a bull ride. Initially told that he was invited onto the set to watch the broadcast, they surprised him by offering a chance for him to be a live commentator of the event. Without missing a beat, Ethan took the microphone and joined the broadcast for seventeen exciting, banter-filled minutes. He describes the whole experience as the most amazing week of his life. Ethan’s cerebral palsy is a result of a stroke before he was born. It limits the use of his hand and both legs. His first surgery was at the age of six months and his most recent was in March of this year with many orthopedic procedures in between. The mission of The Dream Factory is to grant dreams for critically and chronically ill children. It was during the weeks leading up to his most recent surgery that Ethan finally identified his dream and put it in writing. He knew that if a dream was granted, he would only get one. His trip to the World Finals was more than he could have imagined it to be.